Quite a long time since I last put keyboard to work – one very enjoyable family visit and various computer problems being the excuse for such laziness. On the 30th March we went to a presentation by the Director of the new airport soon to be opened in Brive. This was organised by the Franco-British Chamber of Commerce, and was also an excellent networking opportunity – with a superb buffet lunch. The airport will open on 15th June, but so far the management are still in negotiations with the low cost carriers, although they hope to have 3 flights a week to the London area operating later on in the year. The only guaranteed flights they have are a commuter flight to and from Paris, which is apparently very expensive. Nick, Lisa, Jake and Esme arrived after a very exhausting drive from Calais. They seemed to like the house and the village, and we tried to get out and see a few places, despite some indifferent weather. We had a wander round Brive, sampling the hot chocolate in a coffee shop. Lisa was much taken by one of the Trocs – these are large secondhand / antique stores selling on behalf of customers. There are certainly some bargains to be had in the older furniture. 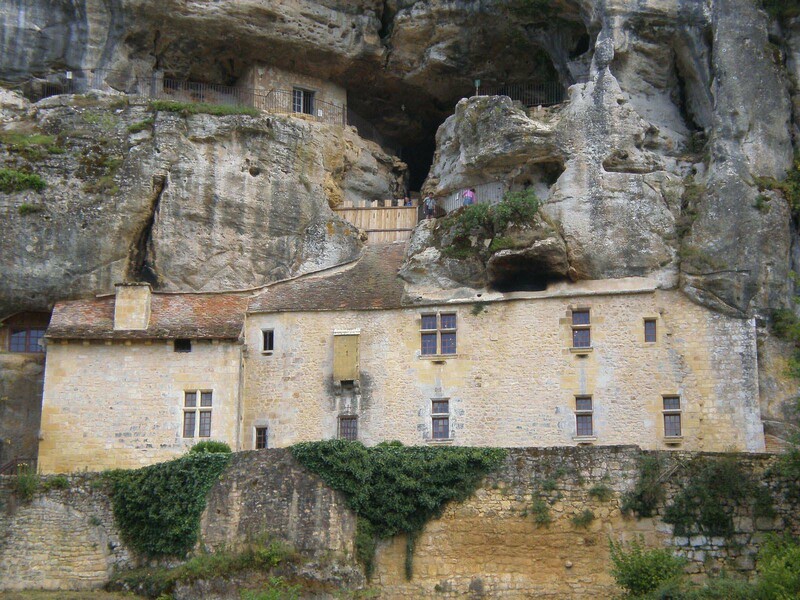 The next day we travelled down the valley of the Vezere – this is the area that contains many of the cave painting and very early remains. A big hit was the Roque St Christophe – dwellings cut out of the rock high up in a cliff. They were occupied for thousands of years – from cavemen right up to there being a complete mediaeval village attached to the cliff face. This is taken a step further at a site just down the road at Reignac. 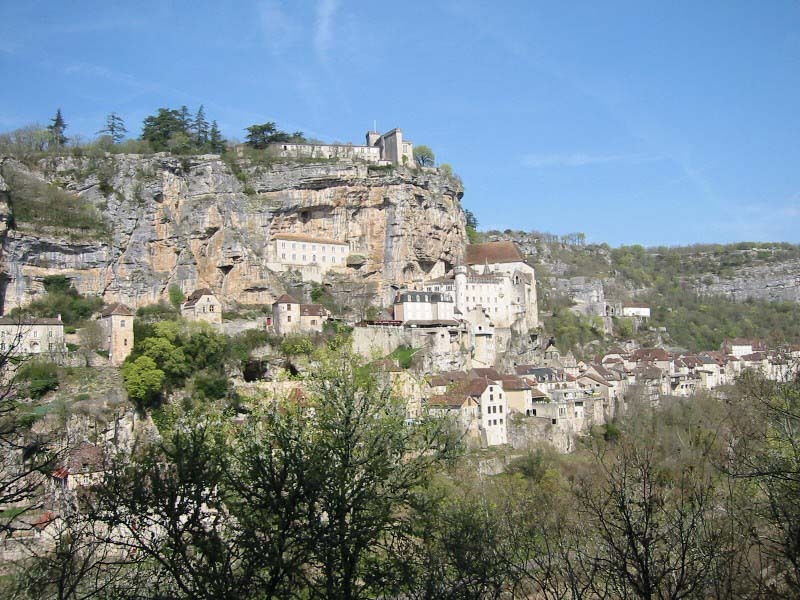 Here the ancient dwellings eventually developed into a fortified manor house – again built into the cliff high above the marauders who swept back and forth across this part of France. 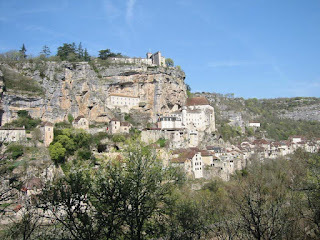 After a day spent touring a bit closer to home – and dodging the rain showers, we all went to Rocamadour, a world heritage site and a pilgrimage centre almost hanging from a steep cliff. We then split up as Nick and family went the Goufre de Padirac, and underground grotto and lake. Judy had already seen this some years ago, so we met up again at Collonges la Rouge, a very pretty village on the way home. Sadly the visit just flew by, and Nick and family set off home via Honfleur on the Channel coast to break the drive. Hope to see them again soon. Of course as soon as they left the weather started to improve! Unfortunately my PC decided to finally give up the ghost, so I am typing this on my all new Windows 7 all singing and dancing replacement. I was able to get it from an English supplier nearby – not that I have any problem with French suppliers – just French operating systems and keyboards! On the 14th we had a very enjoyable wedding anniversary dinner at the Auberge sur Vezere, a small hotel we have stayed in a couple of times and where we eat on special occasions! We met a couple from Cheshire who were just buying a holiday home. He was an ex policeman, and she was a former nurse called Judy! There our paths diverged as he started his own business which turns over £18 million a year. We are having a couple of quiet days now – I'm getting the new PC working, and we are both gathering our strength as Rachel arrives tomorrow!